I once had a student named Terrel (not his real name) who did everything he could to get under my skin. He threw stuff across the room when I wasn’t looking, interrupted me nearly every time I began to speak, made inappropriate comments out loud in class that I wouldn’t have even muttered in middle school, tortured substitutes on days I was absent, and refused to turn in any of his assignments. He was without a doubt the most difficult student I’ve ever had. Of course, I had many stern talks with him in the hallway, called home to his mother, and sent him out of my room many times. Terrel made me question what kind of teacher I am, and I often wondered why my classroom management was so poor after several years of teaching. But more than that, I wondered why this kid hated me. Why did he hate my class so much that it was his mission to destroy it? Then something interesting happened. Terrel started showing up to my classroom 30 minutes before school started every day. Some days he would come in with his friends and just sit and talk with them; other times he would show up alone and sit by my desk while I was grading or preparing for the day. At first, he acted the same way that he did during class, and tried to annoy me or disrupt the work I was doing. I made it clear to him that he is always welcome in my room, but that he could not act like that in the morning. I thought that would urge him to stop coming to my room in the morning and bothering me. But Terrel kept showing up, and it wasn’t long before he started asking me questions about my personal life. He’d ask me about my kids, what I do for fun, how I could possibly want to be a teacher and deal with kids like him. This opened the door for me to start asking questions. I learned he grew up in a broken home without a father. He told me about trauma that he experienced as a little kid, and hinted at trauma he was experiencing now. It became Terrel’s daily routine to stop my room and continue the conversation. In class, he still acted like a punk at times, but when I’d address him, he would stop instantly, realizing that he was disrespecting this person who he has such quality time with every morning. As the months went by, his behavior improved more and more. Then he did something he’d never done before: he passed an English class. I think back to when I thought that Terrel hated me and my class, and that he was expressing his hate through this behavior. But now I realize that he wasn’t hating me, but was actually testing me. He wanted to know if I was going to be like every other man in his life who gave up on him and walked away. And if I’m being completely honest, I really did want to give up. None of the discipline approaches that I was taught in school or used prior to Terrel worked with him. And once that happened, he started working and learning like he’d never done before. So inspiring. And so true. It’s perfectly true-build a bridge! Definitely makes a difference. This, in my opinion, should be developed from Day 1. That’s true! Our students can read through the fake. They desire authenticity from us so they can return it. This video made me stop and think. To be honest at times I just see children talking all the time and instead of wondering if they are asking for help I just tell them to stop talking. This video has taught me to stop, analyze what’s going on and listen to see if there is an explanation or is the child just talking for no reason. I’m guilty, too. It mostly depends on the child, though. Some I ask if they have a question, and some I just know they are talking about something random. Of course, mine are too young to rate Brittany Spears or Christina Aguilera. They’re probably talking about their favorite Fortnite dance. Yes I agree, I learned that a lot of our children may not get the attention at home and being that ear enhances them to gain respect for you. I have worked for several years as a TA, and I have found this to be so true. I formed many personal relationships with the “bad” kids and they were very rarely’ “bad” for me. Same here, Kristy. One of our most notorious students has always been good for me, and I think its because I figured him out. I gave him enough space and attention that he knew I was there, but not breathing down his neck. Even on his worst days he still hugs me. Relationships are important. I’d rather work WITH someone than FOR someone– and its the relationship that makes the difference. Sadly, I feel like there’s just never enough time to really get to know all my students and let them tell me the stories they want to share. As I read this link, I could picture myself in the shoes of the teacher. It is vital not to give up on any child, even though it seems they may not listen us. They all desire love even though they may be used to it in different ways. It is our role to find that way by simply just developing a relationship. It will stick with them! Is the student giving you a hard time, or is the student having a hard time? Without building a relationship with that student you may not know where the behavior is coming from. 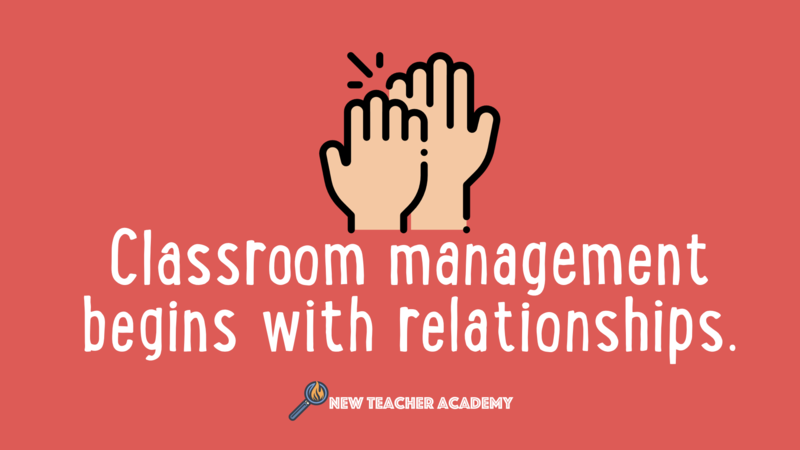 By building a relationship and getting to know your students you are able to connect with them on a different level and in turn (hopefully) help them succeed academically, and maintain classroom management. Very well stated and encouraging for the difficult moments. There is usually an underlying reason as to why certain behaviors are present. This video was very interesting to me. Reading about Terrel helped me realize that sometimes students do stuff to bother you or push your button just because they need someone to talk to but don’t know how to. To me, Terrel went through all of this just to have a “adult friend” to talk to. Many “behavior problem” children do not have that role model to talk to or that person to give them attention. So, they will use their behavior to get that attention.